The Flex Premium Arm Blaster perfectly supports your elbows and enables you to keep the correct posture during curls. Users immediately notice proper bicep isolation when curling with the Flex Arm Blaster. The Flex bicep bomber is endorsed by the leading fitness experts. 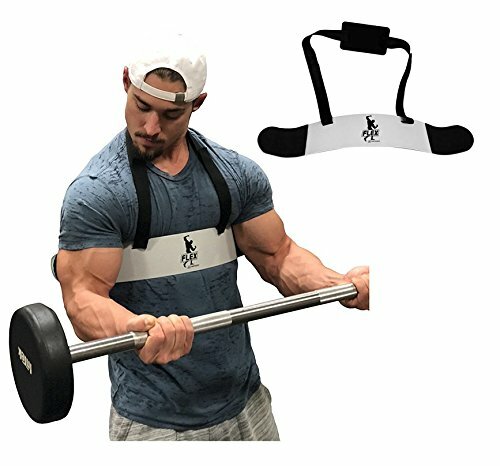 The Flex Premium Arm Blaster perfectly supports your elbows and enables you to keep the correct posture during curls and tricep exercises. Users immediately notice proper bicep isolation when curling with the Flex Arm Blaster. Constructed of thick gauge aluminum. Padded abdomen, elbow and neck pad for comfort, support, and stability. Max weight supported is 70 lb. dumbbells or 140 lb. curl bar. Adjustable velcro strap made of heavy duty webbed nylon. The neck pad is made of neoprene. Premium bicep bomber for serious exercise enthusiasts.